A team of paleontologists has discovered the oldest known “horned” dinosaur fossil from North America. Named Aquilops americanus, the species is 40 million years older than the iconic Triceratops. A fossil skull small enough to fit in the palm of your hand represents the oldest species of horned dinosaur named from North America. The discovery, announced by a multi-institution team including the Raymond M. Alf Museum of Paleontology at The Webb Schools, is 40 million years older than the iconic Triceratops. The new dinosaur is named Aquilops americanus, meaning “American eagle face.” The name refers to the hook-like beak at the front of the skull, used to snip plants during feeding. It lived around 108 million years ago, in what is now southern Montana. Aquilops (pronounced “uh-QUILL-ops”) was about the size of a rabbit, weighing around 3.5 pounds and measuring around 2 feet in total length. It belongs to a group called ceratopsians, better known as horned dinosaurs. 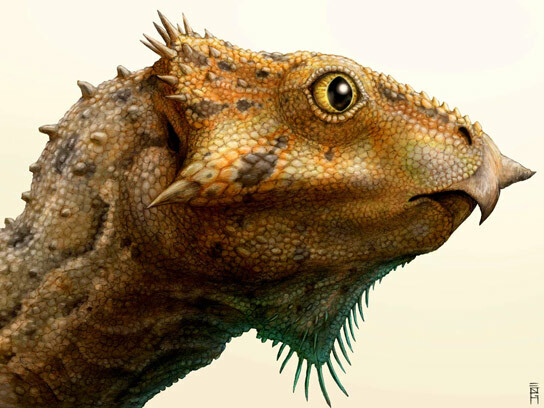 Unlike its famous relatives, such as Triceratops, Aquilops lacked horns and a bony neck frill. The animal is nearly 20 million years older than the previous oldest horned dinosaur named from North America. Surprisingly, Aquilops turns out to be more closely related to ceratopsians from Asia than to other ceratopsians from North America. This is consistent with evidence from other animals, including carnivorous dinosaurs as well as early mammals, showing an immigration of species from Asia into North America sometime between 115 and 105 million years ago. The fossils of Aquilops, including a partial skull and lower jaw, was found on an expedition led by Richard Cifelli, curator of vertebrate paleontology at the Sam Noble Oklahoma Museum of Natural History, Norman, Oklahoma, and the original fossil is housed there. Fieldwork was funded by a National Geographic Society Committee for Research and Exploration grant. Other researchers who co-authored the study included Desmond Maxwell (University of the Pacific) and Mathew Wedel (Western University of Health Sciences). 1 Comment on "Aquilops Americanus – Oldest Known Species of Horned Dinosaur from North America"
The skull is in the collections of the Sam Noble Museum in Norman OK. This website features their ongoing work on an interactive digital reconstruction of Aquilops. Try it out!